Best known for: Traveling around the world in 72 days and investigative reporting on a mental institution. Where did Nellie Bly grow up? Elizabeth Jane Cochran was born in Cochran's Mills, Pennsylvania on May 5, 1864. She was a smart girl who enjoyed playing with her older brothers. She often wore pink dresses, which earned her the nickname "Pinky." When she was six years old her father died and the family came on hard times. She worked odd jobs to try and help the family, but jobs were hard to come by for women at the time. She wanted to teach, but had to drop out of school after one term when she ran out of money. When Elizabeth was 16, she read an article in the Pittsburgh newspaper that portrayed women as weak and worthless. It made her angry. She wrote a scathing letter to the editor of the paper to let him know how she felt. The editor was so impressed with her writing and passion that he offered her a job! 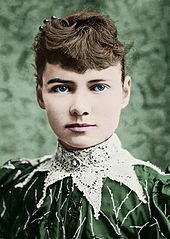 She took the pen name "Nellie Bly" and began writing articles for the paper. In 1887, Nellie moved to New York City and got a job with the New York World. She was going to go undercover at a women's insane asylum to report on the conditions. Once she was inside, she would be on her own for 10 days. Nellie knew it would be scary and dangerous, but she took the job anyway. In order to get into the asylum, Nellie had to pretend to be insane. Nellie checked into a boardinghouse and began acting paranoid. Soon, doctors examined her. She claimed to have amnesia and they decided she was demented. They sent her to the asylum. What was it like inside the asylum? The conditions that Nellie encountered in the asylum were horrible. The patients were fed rotten food and dirty water. They were subjected to ice cold baths and were abused by the nurses. The hospital itself was dirty and filled with rats. Patients were forced to sit on benches for hours where they were not allowed to talk, or read, or do anything. Once Nellie was released from the asylum she wrote about her experiences. She became famous for her bravery and reporting. She also helped to expose the poor treatment of the asylum patients and to improve their conditions. Nellie went on to write more investigative articles about the unfair treatment of women in the late 1800s. In 1888, Nellie had a new idea for an article. She would race around the world in record time. Her goal was to beat the time of the fictional character Phileas Fogg from the story Around the World in Eighty Days by Jules Verne. Nellie's record trip began at 9:40 a.m. on November 14, 1889 when she boarded the ship the Augusta Victoria in Hoboken, New Jersey. Her first stop was England. She then traveled to France, through the Suez Canal, to Yemen, Ceylon, Singapore, Japan, and San Francisco. Sometimes she worried when delays or bad weather slowed her down. When Nellie arrived in San Francisco, she was two days behind schedule. It didn't help that there was a huge snowstorm raging across the northern part of the country. By now, Nellie's trip had become famous across the country. The New York World chartered a special train for her across the southern part of the country. As she traveled across the country, people met her train and cheered her on. She finally arrived in New Jersey at 3:51 p.m. on January 25, 1890. She had made the famous trip in a record 72 days! Nellie continued to fight for the rights of women throughout her life. She married Robert Seaman in 1895. When Robert died she took over his business, Iron Clad Manufacturing. Later, Nellie returned to reporting. She was the first woman to cover the Eastern Front during World War I.
Nellie Bly died from pneumonia on January 22, 1922 in New York City. The name "Nellie Bly" comes from a song called "Nelly Bly" by Stephen Foster. Before entering the insane asylum, Nellie spent six months in Mexico writing about the Mexican people. She upset the government with one of her articles and had to flee the country. A competing paper sent their own reporter to try and beat Nellie in her race around the world. The other reporter, Elizabeth Bisland, went the opposite way around the world, but arrived four days later. She received patents for several inventions including a stacking garbage can and an innovative milk can.